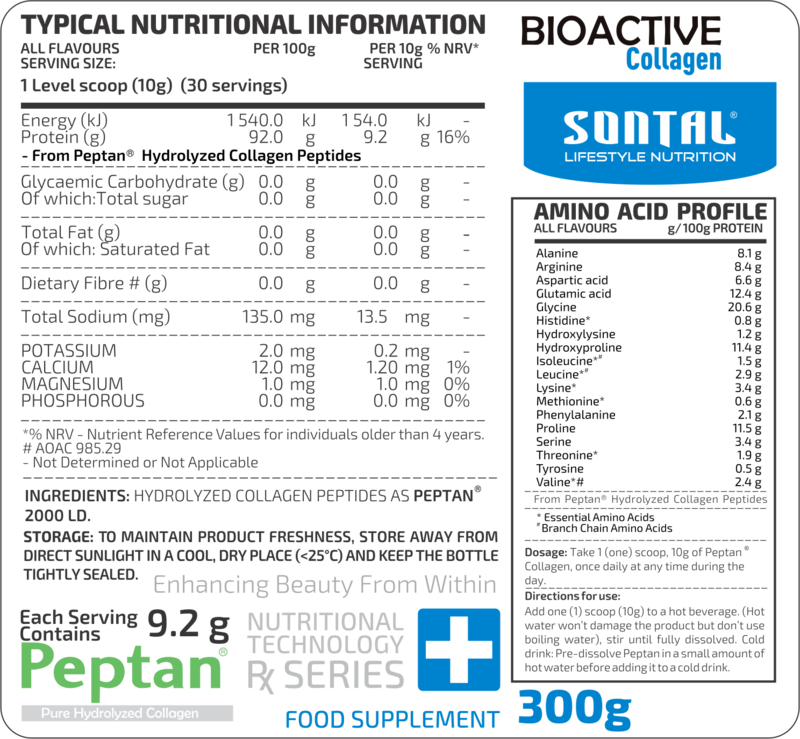 SONTAL BioActive Pure Peptan® Collagen SONTAL Bio-active Pure Collagen contains Peptan hydrolyzed bovine collagen Type I. The contents of the product is pure Peptan and contains no additives at all. As your body ages, collagen production in your body slows down and your collagen level starts to decline. This process already starts as early as your mid-twenties. A large part of the proteïen in your body consists of collagen, specifically collagen type I. Collagen gives structure to your body and is important for healthy skin, bone, tendons, ligaments and more. Studies have shown that Peptan hydrolyzed collagen is highly bio-available and have an absorption rate of 90%. It further proved to enhance skin health by increasing elasticity, smoothness and hydration of the skin. Peptan Research has shown that collagen peptides can stimulate the endogenous production of collagen in bone tissue, triggering osteoblasts (bone formation cells) and increasing bone size and firmness. Why BioActive Pure Peptan® Collagen? Every year as the ageing process takes its toll on your body, you suffer from more aches and pains. Stop your suffering. Use SONTAL BioActive Pure Peptan® Collagen to rebuild your stores of fresh collagen. Joint flexibility and reduced arthritic pain.